Over 2200 Arabs made the short trip up the Angus coast to take in the game on a cold afternoon. Manager Robbie Neilson had promised to play a strong team in this competition, and was as good as his word as only three changes were made to the team which beat Dunfermline 1-0 in United’s previous match. 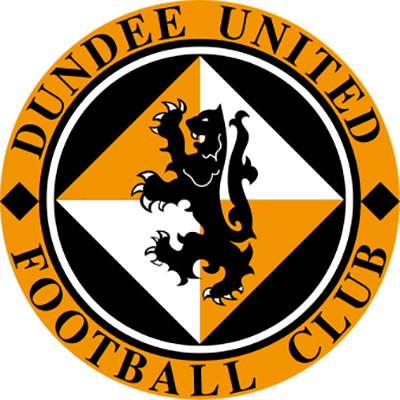 Fraser Fyvie, Matty Smith and Stewart Murdoch all dropped out to be replaced by Aidan Nesbitt, Paul Watson and Morgaro Gomis, the latter who was making his debut in his third spell at Dundee United. Gomis rolled back the years with a wonderful controlling performance in the centre of the United midfield. Perhaps mindful of the possibility of a cup shock, United started the game on the front foot. Pavol Safranko was played through on goal in only the second minute, and although his shot was saved, he was deemed to have been in an offside position. After six minutes Sam Stanton broke through from midfield and after being played through by Paul McMullan he dragged a low drive past the post. It only took a further two minutes for United to take the lead. Sam Stanton again broke through from midfield and played the ball to Aidan Nesbitt on the left. His cross into the box was blocked by former United defender Sean Dillon but Pavol Safranko was on hand to nod the ball into the net from a couple of yards out for his ninth goal of the season. Even at this early stage, United looked entirely comfortable as Morgaro Gomis controlled play in the middle of the park. It was not until the 17th minute before United had their next chance, however, when Aidan Nesbitt found space on the edge of the Montrose area. He turned and hit a low shot which Montrose goalkeeper Allan Fleming was able to deal with comfortably. United forced a series of corners during this period of the game, which the home defence were able to deal with. On the 25th minute some good build-up play between Morgaro Gomis and Aidan Nesbitt led to a chance but the final ball to Callum Booth on the left was a little bit short and the chance was gone. Nesbitt was looking a real threat in what was his first start for United, and after half an hour he enlivened proceedings with a superb backheel flick into the path of Sam Stanton, although the chance was again snuffed out by the home defence. With ten minutes to go until half time, only an amazing goal line clearance prevented United from doubling their lead. A free kick was floated into the penalty box by Aidan Nesbitt to Paul Watson at the back post, and his diving header looked like it would be the second goal. However, Iain Campbell somehow managed to reach the ball and acrobatically hook it clear from almost on the goal line. However, the second United goal was not long in coming. With two minutes left before half time, left back Callum Booth was fed by Sam Stanton after the United midfielder had latched on to a half cleared free kick into the box from Paul McMullan. The left back hit a low right footed drive from 25 yards which smacked off Allan Fleming’s left hand post and into the net. It was only the second Dundee United goal for Booth, and it was a special one. The second half was a rather more sedate affair as United seemed content to play out the game in second gear. 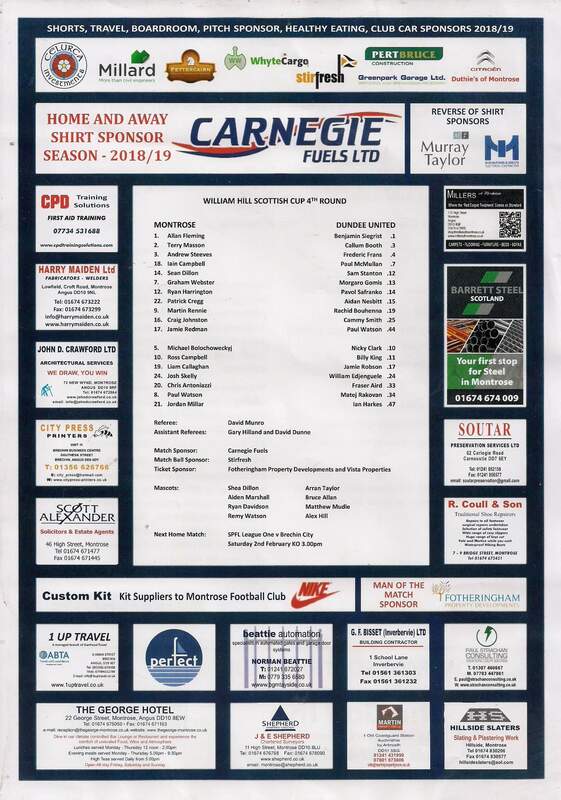 They did have another chance ten minutes into the half when Cammy Smith came very close to converting a through ball into the box by Aidan Nesbitt, but after making a couple of changes just after that United chance Montrose had their best spell of the game. Paul Watson and Ross Campbell came on for Chris Johnston and Jamie Redman, and this sparked the home side into life. 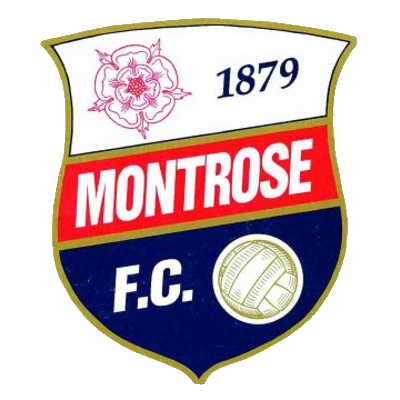 Watson had Montrose’s first chance a mere minute after coming on, although his shot was straight at United goalkeeper Ben Siegrist. 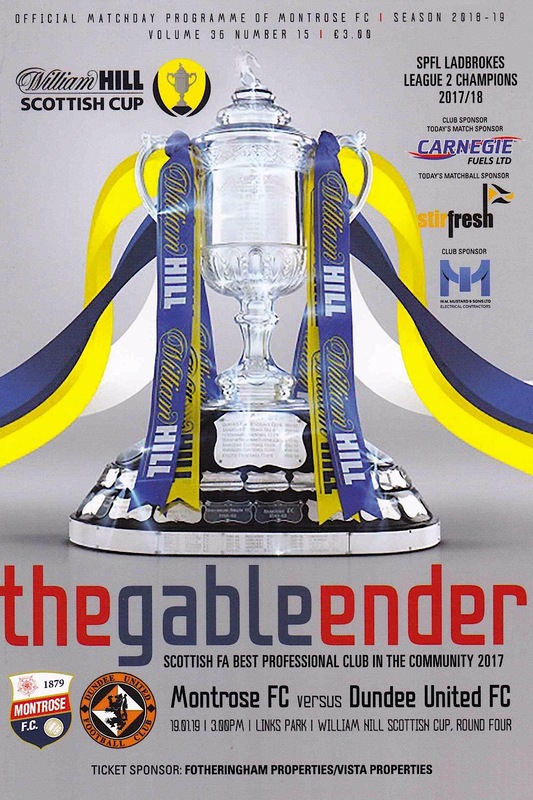 Two minutes later, only a superb sliding tackle from Frederic Frans prevented Montrose from pulling a goal back, his challenge on the onrushing Ross Campbell preventing an almost certain goal for the home side. Graham Webster had another chance for Montrose a few minutes later, but he could only shoot wide of the post. Robbie Neilson responded by bringing on Nicky Clark for the tiring Aidan Nesbitt. The next chance came for United as Cammy Smith smashed a first time shot over the bar with what was United’s first shot at goal in some time. This was Smith’s last action of the game as he was soon replaced by Ian Harkes for his United debut, becoming the first American to play for Dundee United. Harkes nearly opened his account for United a mere five minutes after coming on, as Callum Booth found him at the back post with a deep cross from the left, but Harkes could only send the ball over the bar. Booth had another effort from 25 yards soon afterwards, although this time Allan Fleming was able to palm the ball away and out of danger. Billy King replaced Pavol Safranko with nine minutes left to play, and managed to score with his first touch of the ball seconds later after Nicky Clark controlled a long Paul Watson ball down the United right before passing the ball to King who was on his own near the penalty spot. The United winger guided the ball into the far corner of the net on the volley to make the score 3-0 and confirm United’s place in the next round. A stunning save from Montrose goalkeeper Allan Fleming in the 86th minute prevented United from scoring a fourth goal. A shot from Paul McMullan was diverted towards goal by the knee of substitute Nicky Clark, and looked goalbound until Fleming produced a stunning reaction save to tip the ball over the bar. However, the fourth goal did come in the final minute. After a Paul McMullan cross from the left was charged down by Sean Dillon, the ball came back to the United winger. He was able to cut the ball back to debutant Ian Harkes who slotted the ball home from six yards out to put a further gloss on the scoreline. The referee blew his whistle for full time soon afterwards, and United were comfortably into the next round of the draw, which considering the number of cup shocks there were on the same day was no small achievement. The early goal had by and large killed the tie, but it was a professional performance. The day afterwards, United learned that their fifth round tie would be a difficult trip away to Premiership side St Mirren in three weeks’ time.